Τhe last few years, assisted reproductive technology, molecular biology and cytogenetics have progressed considerably, opening up new options in the diagnosis of hereditary and genetic disorders. 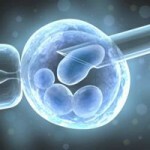 Since 1990 it is possible to genetically test embryos before they are transferred to the uterus! This method is known as Preimplantation Genetic Diagnosis (P.G.D) and is a reproductive technology that offers couples, at high risk of transmitting a genetic disorder to their future offspring, a valuable diagnostic tool. Genetic information, in other words our genes, is encoded as DNA sequences within our chromosomes. Normal cells have 46 chromosomes (23 pairs). After fertilization, normal embryos have 23 chromosomes contributed by the spermatozoon and 23 chromosomes contributed by the oocyte. If an embryo has a missing or an extra chromosome it is called aneuploid and it is considered abnormal. Alan Handyside and his colleagues introduced Preimplantation Genetic Diagnosis that improved birth rates of healthy babies worldwide. Diagnosis of monogenic disorders has helped couples where both partners are carriers of the defective gene for a specific genetic disorder (e.g. a or b-thalassemia). Testing for chromosomal abnormalities involves either numerical disorders or structural abnormalities. It is known that the incidence of chromosomal abnormalities (e.g. Down syndrome) increases with maternal age. However, there are also other factors, than maternal age, contributing to structural chromosome abnormalities (chromosomal inversion or translocation). It is common to find in couples that one or both partners are carriers of a chromosomal abnormality (not necessarily the same). This abnormality, not expressed in parents, may cause recurrent miscarriages or repeated IVF failure. Preimplantation Genetic Screening (P.G.S) can diagnose chromosomal abnormalities and protect the couple from the emotional distress or somatic burden caused by recurrent miscarriages or repeated IVF failure. Moreover, time and money are saved. The terms Preimplantation genetic diagnosis (PGD) and screening (PGS) have been replaced by Preimplantation genetic testing (PGT). PGT for chromosomal structural rearrangements (PGT-SR). *According to The International Glossary on Infertility and Fertility Care, 2017. There are two basic techniques used for PGT, fluorescent in situ hybridization (FISH) and Polymerase chain reaction (PCR). FISH has been used to diagnose numerical chromosome errors (aneuploidy – missing or extra chromosome) while PCR is mainly used to detect gene mutations. In the last few years, a new molecular cytogenetic technique developed, known as Array Comparative Genomic Hybridization (a-CGH). a-CGH or other approaches of CGH have been applied successfully to substitute FISH and simple PCR, as it can identify structural chromosome errors and also diagnose specific gene mutations. Lately Next Generation Sequencing (NGS) is the new technology for comprehensive chromosome testing of IVF embryos. Next Generation Sequencing for PGT is likely going to replace other technologies as the predominant method for testing due to lower cost and reduced errors. According to experience with PGT, a successful program involves the interaction between doctors, clinical embryologists, pshycologists and geneticists. It is also very important for the couple to receive proper genetic counseling prior to PGT. Couples having PGT should go through Assisted Reproductive Technologies, even in the absence of infertility. ART is the only way to produce the embryos to be tested, outside the woman’s body. The early embryo (6 to 8 cells on day 3 of development) is biopsied by microsurgical removal of 1 to 2 cells. Some embryologists wait until the embryo reaches the blastocyst stage (day 5 of development) to undertake this biopsy. At this stage more cells can be removed and analyzed. Once collected, these cells have to be analyzed for detection of a certain medical condition. Their genetic material is the same as of the embryo they originated from. In all these procedures, analysis must be completed soon (1-2 days after biopsy). Embryo selection is based on diagnosis. Only healthy embryos can be successfully transferred, with high safety and success rates. An alternative to prenatal diagnostic testing. Couples avoid the distress associated with diagnosis, particularly if late in an established pregnancy. An alternative to termination of pregnancy. Couples for whom the option of prenatal testing and termination is not an acceptable choice may not want to take the risk of a child having a genetic condition. The process has an extremely high success rate of identifying genetic diseases and chromosomal issues. Many couples are unaware that they are carriers for genetic diseases until they have a child with a birth defect. As a woman ages, she is more likely to have a child with a chromosomal defect due to decreased egg quality, PGT can avoid this. With aging women’s eggs growing old what means that gene mutations and damage the integrity of the genetic material arise more often and as a result, frequency of occurrence of embryos with damaged genotype is increased. Women with recurrent miscarriage. It can be connected with abnormal chromosome complement in man or woman’s gametal cells. Couples with autosomal dominant disease or people who has changes of configuration of chromosomes. Couples with repeated failure of IVF (in vitro fertilization). Improved embryo selection. Only embryos presenting no abnormalities in terms of the number of chromosomes will lead to the birth of a healthy child. Therefore, when working with good embryos, when PGT techniques are applied, we are able to select chromosomally normal embryos and rule out those which would never be capable of leading to the birth of a healthy child even when their appearance would suggest that they are good quality embryos. Avoids the transfer of embryos that will not implant. Certain chromosomal abnormalities are incompatible with life and prevent the embryo from developing during its early stages and even from implanting in the mother’s uterus. PGT means that embryos of this kind can be ruled out, thus optimising the number of transfers. Avoids the transfer of embryos that will lead to pregnancy loss. Avoids the birth of children with a variety of syndromes. Within the range of possible chromosomal abnormalities, some are less harmful to the embryo and allow it to implant. However, they do stop the pregnancy from developing correctly and can lead to pregnancy loss or the birth of a child with a number of possible syndromes such as Down’s syndrome, Patau’s syndrome or Edwards’ syndrome. PGT means that embryos that will be the cause of situations of this kind can be ruled out. Reduces the time required in order to get pregnant. By using PGT, we are able to avoid transferring embryos that will not lead to the birth of a healthy child since they will have been ruled out using the technique. Since we know which embryos will give rise to a full term pregnancy, ‘time is not wasted’ transferring embryos that will undergo embryo arrest during development and will not lead to the birth of a healthy child. Reduces the financial burden. Adding a new analysis to the process could be indicative of an increase in the cost. However, an in-depth knowledge of the characteristics of each embryo means that embryos that would appear to be healthy but which, in fact, are not healthy from a genetics point of view are not frozen and stored. So the cost of transferring frozen embryos that will not lead to a pregnancy is avoided. Positive impact on physiological wellbeing. Using PGT means that the uncertainty that patients go through is reduced. On the one hand, they have the guarantee of the health of their embryo and that the very latest technology has been used in order to ensure this. On the other, the risk of pregnancy loss is reduced and this reduces emotional stress, particularly in the case of patients who have already gone through this. Increases in vitro fertilization implantation and delivery rates. Implantation rates were statistically significantly higher (66.4% vs 47.9%). Delivery rates per cycle were also statistically significantly higher (84.7% vs 67.5%). ◊ The largest risk of PGT is not having embryos available for transfer, if the results of testing show that all of the embryos are chromosomally abnormal. In these circumstances, the cycle is cancelled. ◊ The risk of getting incomplete or no diagnosis on biopsied cells, due to technical or other reasons, also exists. However, the couple will decide on whether to transfer embryos or not, upon detailed genetic counseling. There is always a minor risk of traumatizing an embryo during the embryo biopsy procedure, irrespective of embryologists’ experience. This is more possible with embryos of poor quality. However, the incidence of embryo damage and subsequent degradation after embryo biopsy is very low (less than 1%). All embryonic cells should contain the same number of chromosomes. It is well documented that some embryos have one or more blastomeres with different chromosomal complement. This phenomenon is called chromosomal mosaicism. This means that the blastomere biopsied for PGT may not represent the rest of the embryo and could result in an adverse outcome. For this reason, couples are strongly advised to undergo prenatal testing (amniocentesis or chorionic villus sampling) after PGT in case of achieving a pregnancy. PGT-A is being used to improve the chance of a successful pregnancy in couples with recurrent miscarriages. However, miscarriage due to chromosomal abnormalities can still occur even after PGT-A.